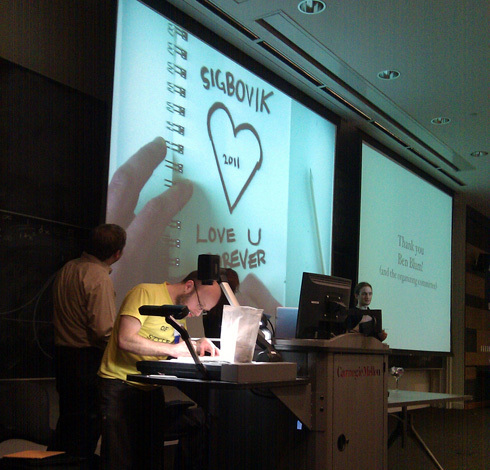 Today was SIGBOVIK 2011, the fifth one. This is my favorite CMU CS tradition; a fake conference thrown with real aplomb (carefully bound and printed proceedings, entertaining talks, product demonstrations, awards, promotion, budget and steering committees, paper management systems and reviews, etc.). People use it as both a venue for childish drivel and for deeply satirical but essentially real work that in my opinion is too good for actual conferences. I love it because of how it simultaneously scorches (for its pointless navel-gazing) and celebrates (for its pointless navel-gazing) academia. I always participate. This year I was emcee and I did not have enough time to execute all of my ideas (do I ever? ), but I did write two papers. The first was just the slapdash results of the thing I posted earlier, Who is the biggest douche in Skymall?. It's more fun to continue to play the on-line game than read the results, though I did add a douche-detecting image recognition "algorithm" to that paper, at least. What I spent the most time on was my paper What words ought to exist?. I tried something different this year. I feel like the conference is filled with loads of satire and irony (which is great), but that the best way to celebrate what I feel is the SIGBOVIK spirit is to be off-puttingly impenetrable about where the work is even coming from. Like "Is this real or a joke? Why did you even do this? I don't understand" is the ideal reaction. So, controlling for SIGBOVIK tenor, this time my paper is a completely earnest and thorough attempt to answer an interesting philosophical question (titular). 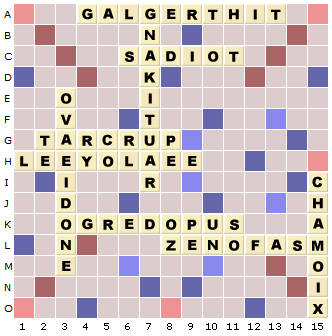 It starts with a maximalist approach, my variant of Scrabble called Scrallbe (where they can all be words), which is pictured above. It's like God mode for Scrabble. I dismiss this as too coarse and then look at a bunch of different methods for figuring out what words should exist, and justifying that mathematically. I tried to write it for the layperson, but I think my notion of layperson may be distorted. Read the paper to decide for yourself. I won another award this year (keeping my perfect batting record! ), this time for "Most frighteningly like real research," which I think is apt. See? No joke. 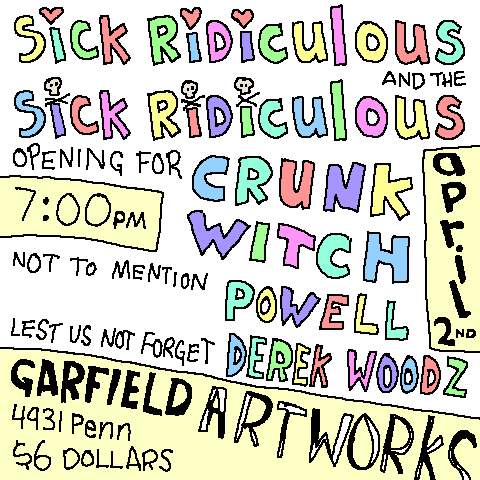 Posters, like with an s, and everything. And the thing is, the difference between the posters, meaning in design aesthetic, that is, total, is like a metaphor for how these shows will be totally completely utterly non-redundant. Not one song will be repeated betwixt them, except for our very newest song, which has never been heard before. 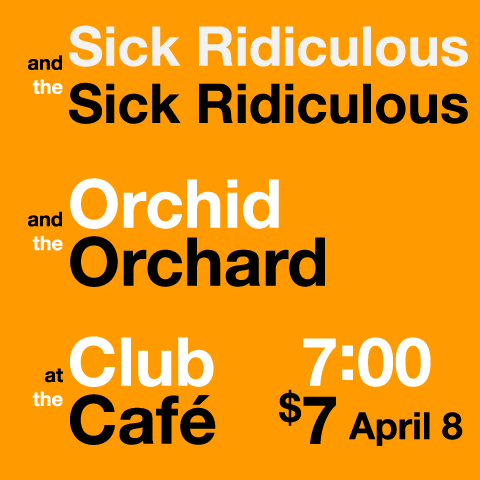 So worst case repetition scenario, if you go to both shows, is that you hear one awesome song that you never heard, twice. Big whoop. Worst case scenario if you miss one, is you might miss out on special treats. More info on this topic as soon as our PR department lifts the press embargo. Hello. 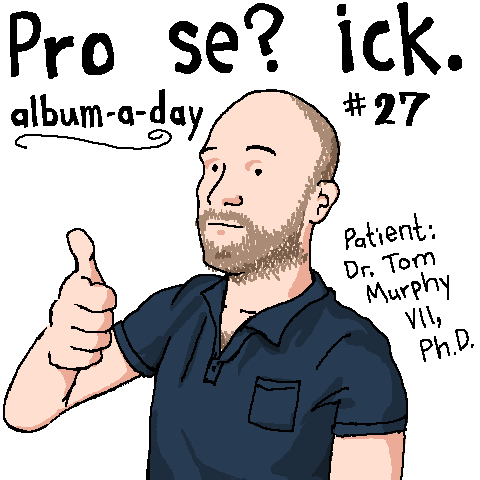 Welcome to my 27th album-a-day, called Pro se? ick.. Editor: Double period warranted because one of the periods is in the title and one ends the sentence, duh. AAD #27: Pro se? ick. I made this one on March 6th and 7th, 2011, taking a vacation day. Realistically I spent almost two days on it, but probably still less than 24 hours. Since I am a bearded old timer I do not feel particularly compelled to follow album-a-day rules. I also violated the rule about not writing the material afresh, i.e. the plaintive version of Spring Break Pittsburgh 2006 wooo from AAD-20, but it seems topical since it is currently Spring Break 2011, wooo. -1,000 points! Spoiler alert: I'll argue self-defense. I made my life extra difficult with this one by holding myself to modern standards, plus trying to minimize repetition in song structure, plus embedding multi-level puns and references and entendre, plus trying to use diverse and dense instrumentation. I think I succeeded, but I sure sacrificed some stereocilia. I also must say that while some songs are literal, not all songs are literal, and when I got stuck I preferred to go with the good line, even if it made it inaccurately dark. Now just get zip or browse page! I'd like to think that my data visualization experiments are self-explanatory, but this one does not have the ability to write or talk so I will do the needful. Each one of the orange lines is a Pac Tom running trip (now a slot-jackpotting 222 of them). The squiggles always start at angle 0, corresponding to 0 miles. They proceed around the radar circle clockwise according to how many Tom-sneaker miles the trip is, with a full revolution being 32 miles. At every point their distance from the center is based on the number of crow-flying miles that I am away from my home, with the outermost circle being 8 miles. Red dot emphasizes the end point. I hope that you appreciate the radial and angular gradations because those were fiddly to make in SVG, particularly the labels. What can we tell from the graphic? Well, most trips start and end at home. This is obvious from The Rules, which require it. You can see that a bunch of them end about the same distance away; these are all me fizzling out at CMU's campus, where water and HVAC are plentiful, or sometimes where I used to leave my junk. You can also see that there's some consistency to the specifics of the routes both at the beginnings and end (like if you look at those 15–20 mile ones that end at CMU, you see the same jog patterns leading up to those ends, which is me taking the same turn on the way back). There's even a more bold orange laser at the beginning, which basically corresponds to me taking any efficient route away from my house, regardless of where I'm going (it is roughly an Archimedian spiral, where after 5 miles of running I'm about 5 miles away from my house). 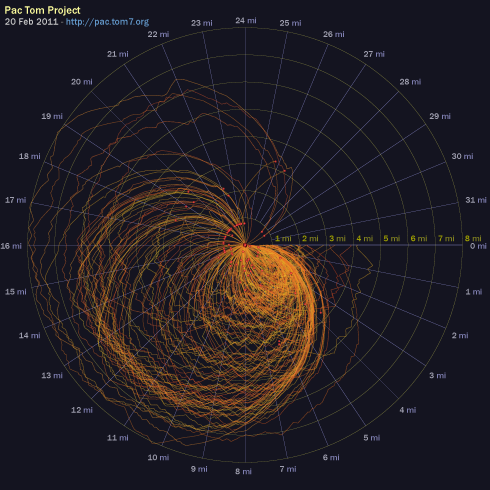 The most interesting thing to me is that there really is a characteristic shape of a Pac Tom run when plotted this way. A typical runner's route (out and back) would be a prolate ellipsis, actually maybe more like a vesica piscis if the runner gets to the summit overlook or no tresspassing sign or whatever and turns right around. My shorter earlydays runs, which are hard to see because they're all bunched up on top of one another in the South-East octant, are kind of like that actually. But the canonical Pac Tom run now is obovate like a ginkgo leaf, where I run away from home then zig-zag back and forth for many miles, creating the tiny leaf teeth at approximately the same distance, then run back home. There's not even any reason why these would have to be leaf-shaped at all; you can see the few Pittsburgh Marathons in there (those count), which are more like abortive Spirographs. I had appendix surgery (meaning they just cut it out and threw it in the biohazard) in September and then a work crunch that disrupted my running for a while, but I'm now back to it. I'm getting in decent shape again for the marathon, which I am excited about mostly because of the costume plans. I just polished off large distant neighborhoods Sheraden and Elliott (after a fairly heartbreaking trip where I thought I had at great effort finished, but had missed a tiny 50-foot segment, so I had to go many miles out of my way to get that one yesterday, in really OCD-affirming style. Having done that is actually one of the diagnostic criteria in DSM VII.) and the remaining cleanup to do on the South Side is pretty light and much closer to my home. I think I can be done with those with maybe two months of regular running, and maybe even finish the North Side, which is all that's left, by the end of 2011? 4500 miles in 27 days 15 hours of running, so far. You may track my progress via the graphics at the Pac Tom ultimate cybersite. In that Luddite void between closing the cabin doors and the beep indicating it is now safe to use approved electronic devices, there is one perfect pleasure: The Skymall catalog. It has everything, including: Pointlessly impractical products you cringe at just imagining someone receiving as unwanted gifts at Christmas, copy that preys on the insecurities of business travelers, typo and physically impossible hyperbole treasure hunts galore, Photoshop disasters, new friends, and old familiar faces. 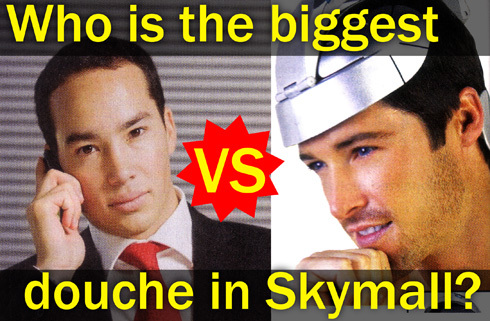 But since 1990, science has wondered: Who is the biggest douche in Skymall? Who is the biggest douche in Skymall? Now, with the benefit of computer technology, you can help me scientifically determine the answer. Just answer an infinite series of more douche / less douche questions. Results will be published in SIGBOVIK 2011, p value notwithstanding.